Found 14 file extension associations related to PowerBASIC and 11 file formats developed specifically for use with PowerBASIC. 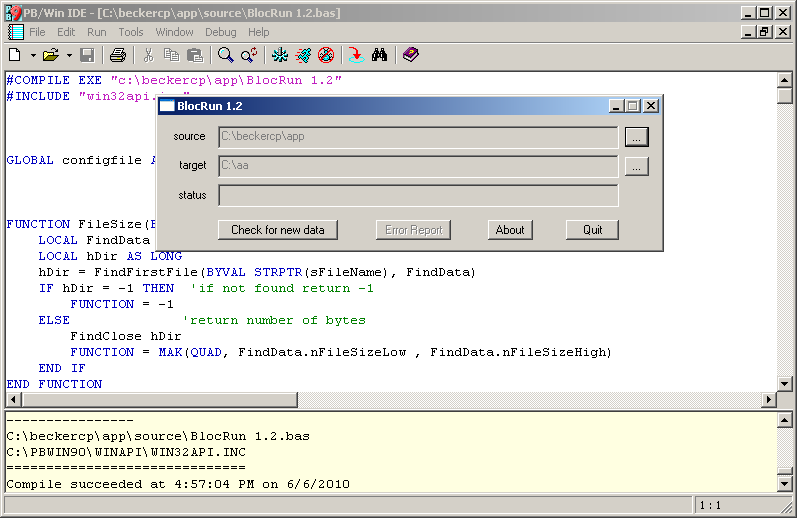 PowerBASIC for Windows is a native code compiler for all versions of Windows, from Windows 95 to Windows 7. It creates applications with a Graphical User Interface (GUI), to provide the typical "Look and Feel" of Windows. It creates highly efficient executables and industry-standard DLLs for optimum flexibility. The machine code generated by PowerBASIC is among the most efficient in the industry, both in terms of size and speed. It compares most favorably with leading compilers of any dialect, Pascal, C++, Fortran, and others. If you need more information please contact the developers of PowerBASIC (PowerBASIC, Inc.), or check out their product website.